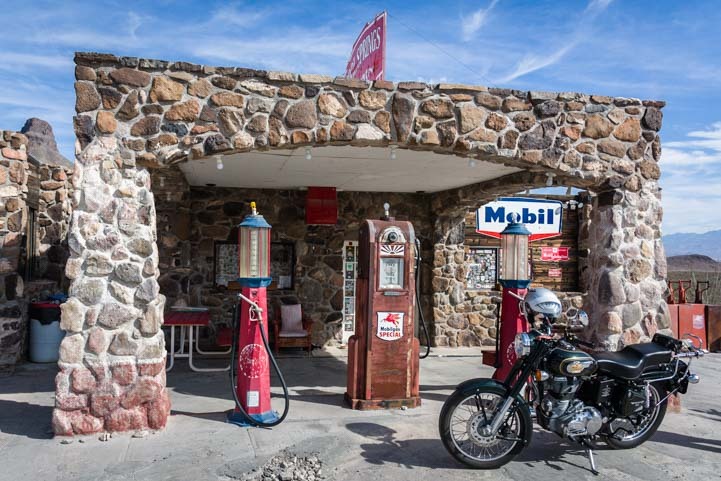 April 2017 – Back in the 1930’s to the 1960’s, Route 66 was a 2,448 mile long road from Chicago, Illinois, to Los Angeles, California, that passed through Missouri, Kansas, Oklahoma, Texas, New Mexico and Arizona. It was established in 1926 but was gradually replaced with the US Interstate highway system starting in 1956. 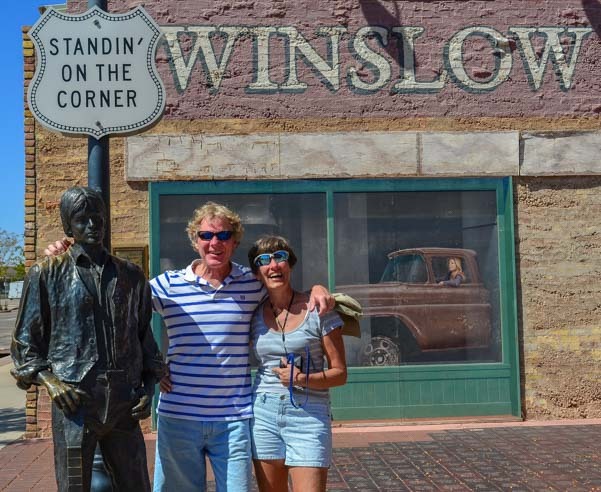 We’ve been getting our kicks on Route 66! Portions of it still remain, and we have been bumping into it in our RV travels through Arizona. 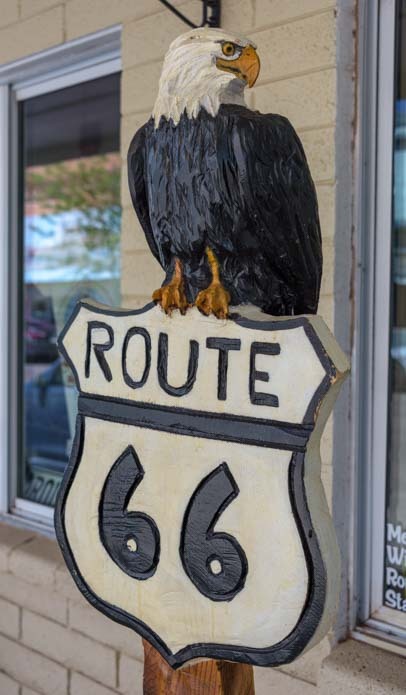 Route 66 is memorialized in all kinds of songs and folklore, and one of the most iconic songs was (Get Your Kicks) on Route 66 written by Bobby Troup in 1946. 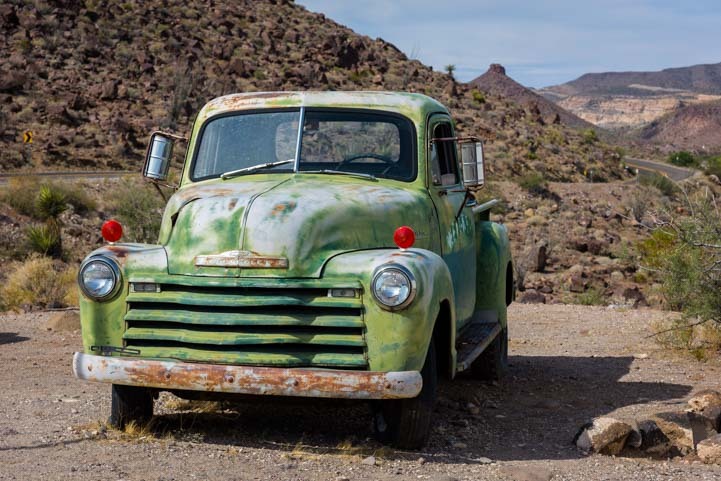 We’ve been getting our kicks on Route 66 lately starting with a stop we made at the Cool Springs Station Museum between Kingman and Oatman, Arizona last fall. 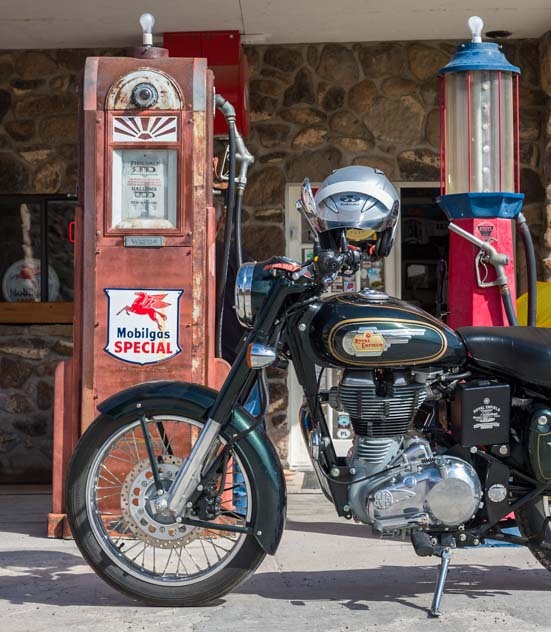 What luck – A retro Royal Enfield motorcycle pulled in and parked next to the antique gas pumps while we were there! 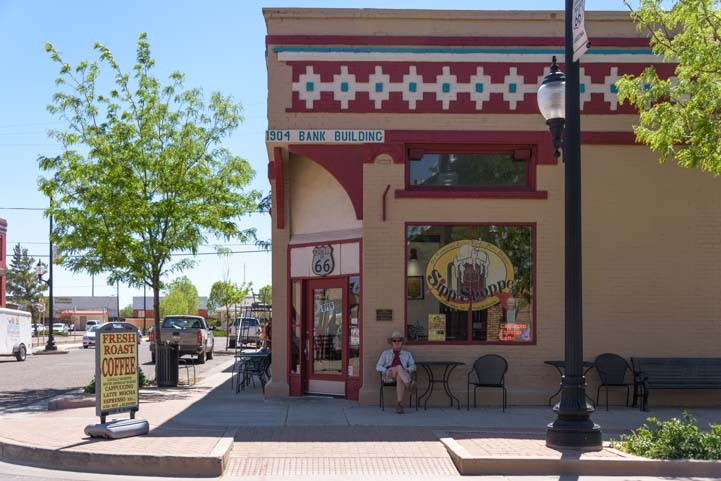 This is a cute stone building that has big antique gas pumps out front that will be familiar to our older readers and Mobil Oil signs that were familiar to us from our childhoods. Inside we found all kinds of charming memorabilia from decades ago, and outside we saw several antique cars that at one time might have rolled down this famous American highway. Cool Springs Station is in the northwest part of Arizona near Kingman. 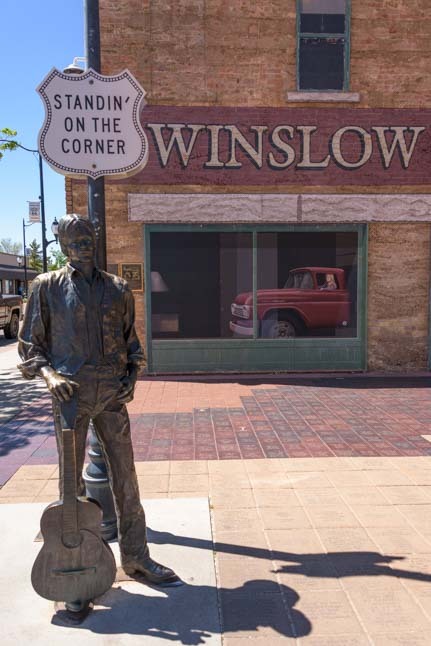 Way over on the northeast side of the state we stopped in at the town of Winslow in northeastern Arizona a few weeks ago. Ford slowin’ down to take a look at me. This corner is now a favorite tourist attraction. Every year the town hosts a huge “Standin’ on the Corner” festival. This year’s event is on May 6, 2017 (link at the bottom of the page). Five years ago on our way back to our boat in Chiapas Mexico we zipped through Winslow and got a selfie at the corner. This year the corner was a little busy with other people getting selfies, so we’ll just go with the old pic! From the archives back in 2012! The opposite corner is dressed up with a vintage coffee and soda shop that has old fashioned seating on stools at the counter inside. 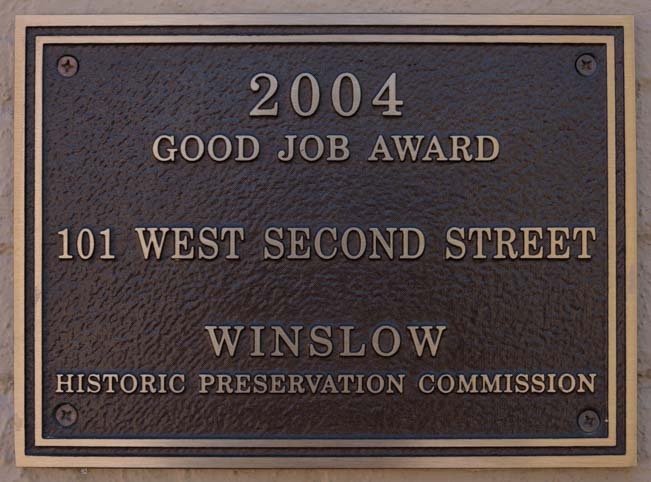 This building won the Good Job Award in 2004. I like a town that gives out Good Job Awards! The world needs more Good Job Awards! 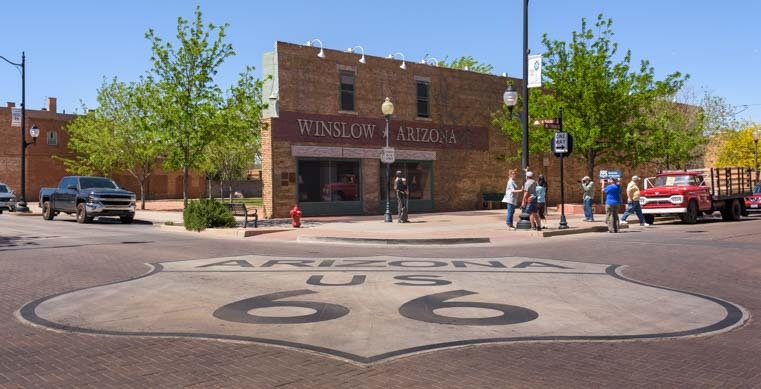 Although Winslow sits on Route 66 it was also an important train depot for the Santa Fe Railroad. 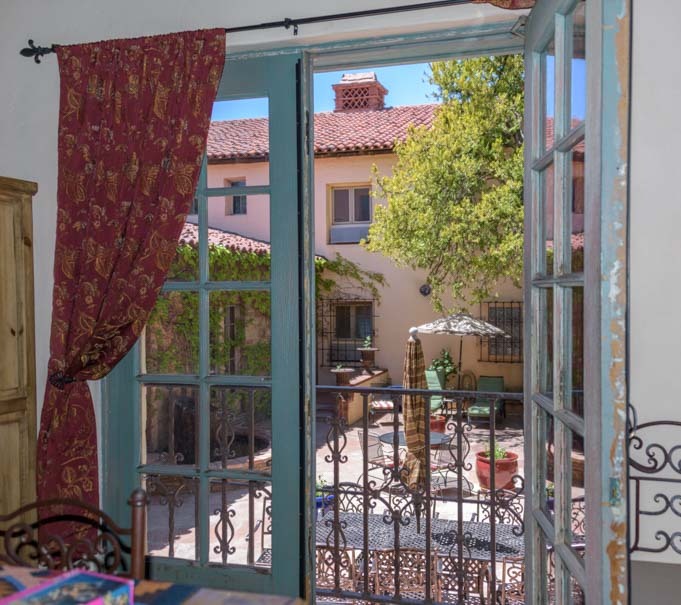 Wandering around town, we came across La Posada Hotel and Gardens which is a meticulously and lovingly restored Grand Hotel from the heyday of the railroad era, built by Fred Harvey for Santa Fe Railroad and designed by Mary Colter. 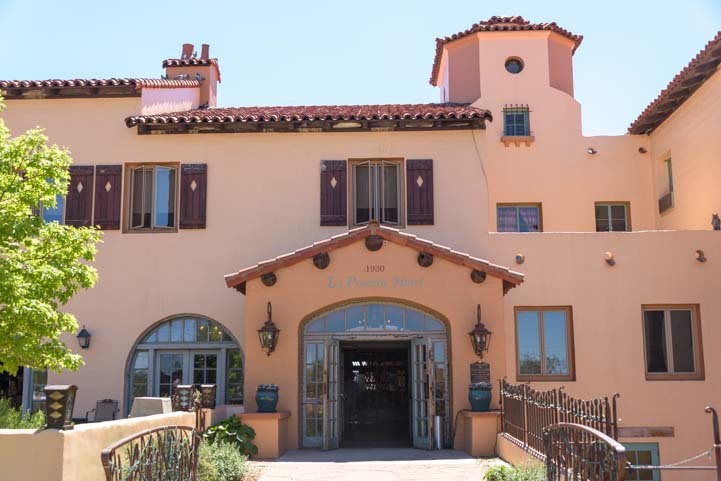 Built in 1929 to the tune of $60 million (in today’s dollars), La Posada Hotel and Gardens gave tourists a reason to take the train to Winslow. 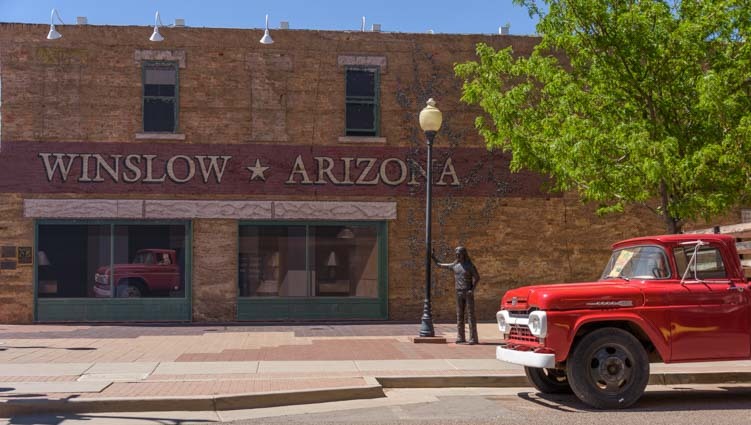 They could stay in an elegant hotel home base and visit Arizona’s many very cool sights that lie within a day’s chauffeured drive from town. 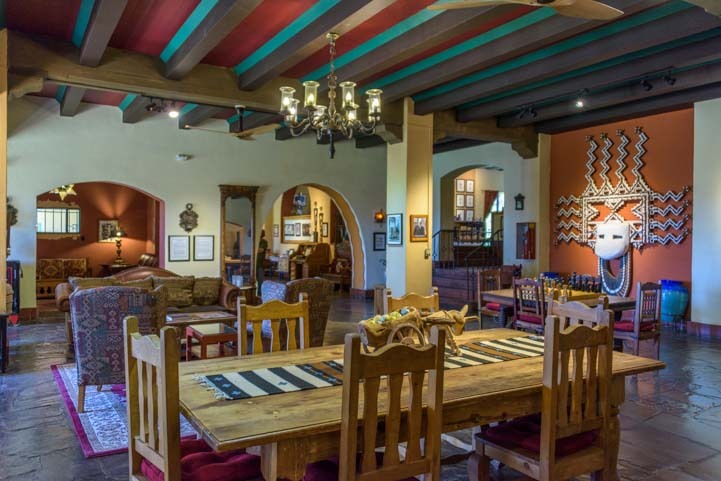 La Posada was southwestern elegance at its best in the 1930’s and 40’s. The hotel was beloved by the well-to-do from its opening in May of 1930 until it closed in 1957. When it closed, all of the museum quality furnishing were sold off, and the building was turned into offices for the Santa Fe railroad. Over the next 40 years it was slated to be demolished several times. The restoration has been lovingly done. Visitors can watch a fantastic video that explains the details of the original design and restoration. 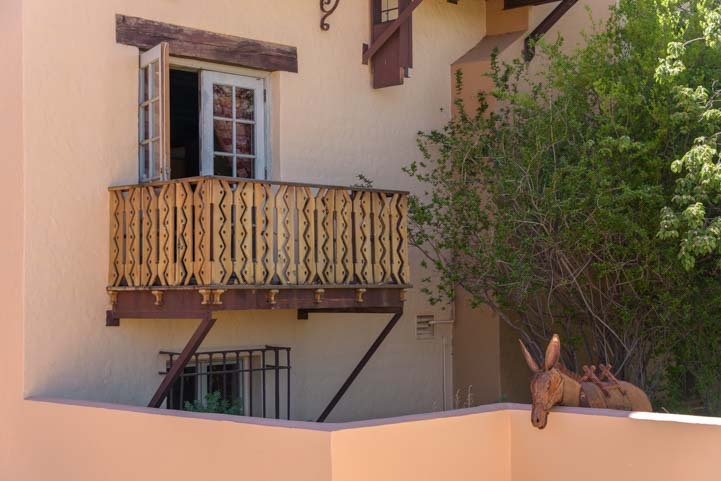 Fortunately, when the Santa Fe Railroad planned to abandon the hotel, news of the its uncertain fate made its way to Allan Affeldt. 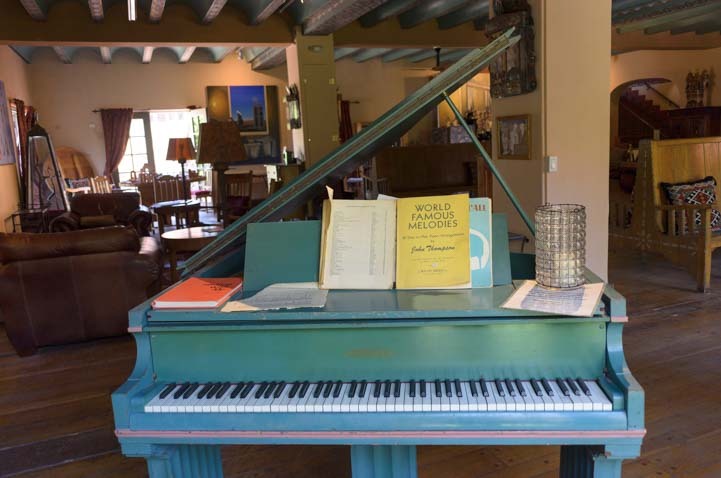 After three years of negotiations with the railroad, in 1997 he moved in with his wife, Tina Mion and they began a $12 million restoration. We knew none of this when we walked in the door, but we were smitten with the beautiful renovations and artsy decorations in every room. There are endless common areas where guests can relax and socialize. The windows and French doors were thrown wide in every room, letting the warm air from outside flow in, and we wandered around the property enchanted by all we saw. La Posada Hotel and Gardens is a fully functioning hotel today and there is a very popular restaurant that was packed to the gills when we stopped by. We didn’t stay to eat, but unusual goodies drew us to every corner of every room in the hotel. 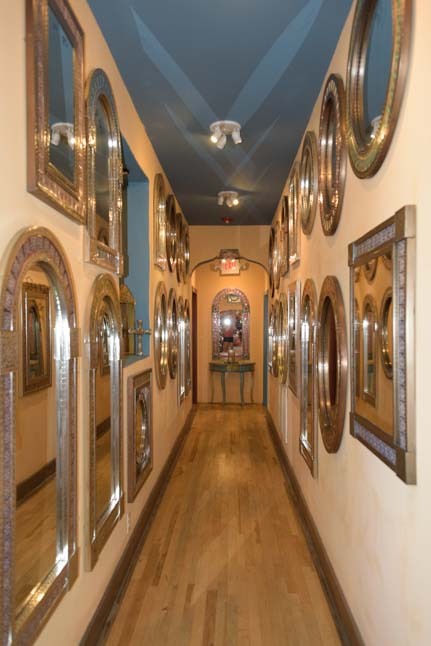 Turning a corner, we came across a “hall of mirrors” which is part of the hotel’s gift shop. Beautiful mirrors are for sale in the gift shop. 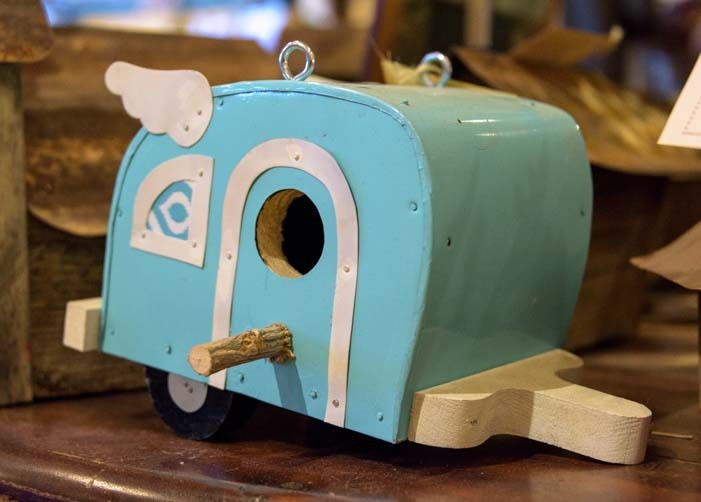 The gift shop had all sorts of things for sale, but the ones that really caught our eye were the adorable antique trailer bird houses! A bird house for the RV crowd!! 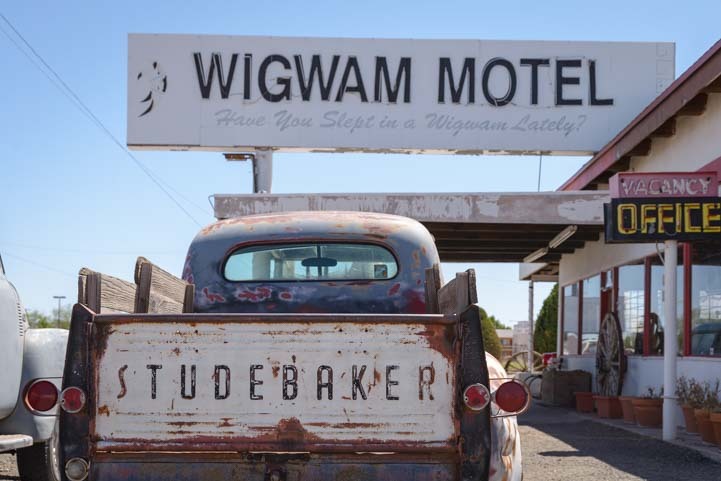 Not far from Winslow, Arizona, we drove through Holbrook, Arizona, and just had to stop at the Wigwam Motel. 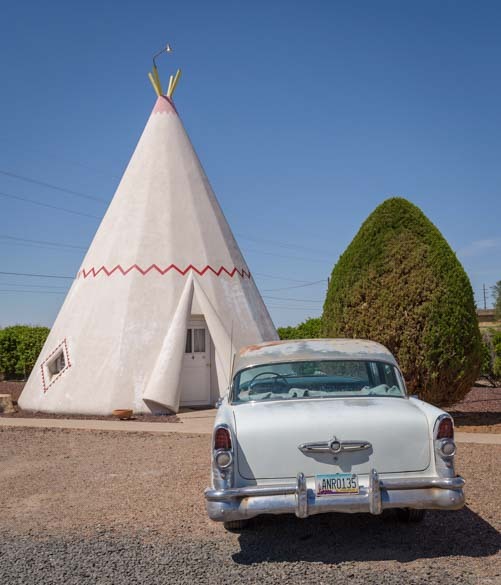 Wigwam Motel in Hobrook Arizona – A Classic Route 66 stopover. 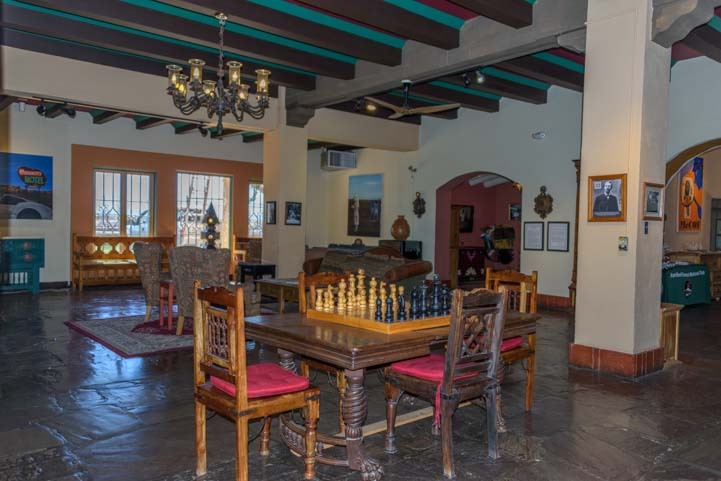 Unlike the very upscale La Posada Hotel and Gardens in Winslow, this is a fabulous Route 66 motel that reflects the funky and slightly cheesy tourist traps that filled Route 66 in its day. 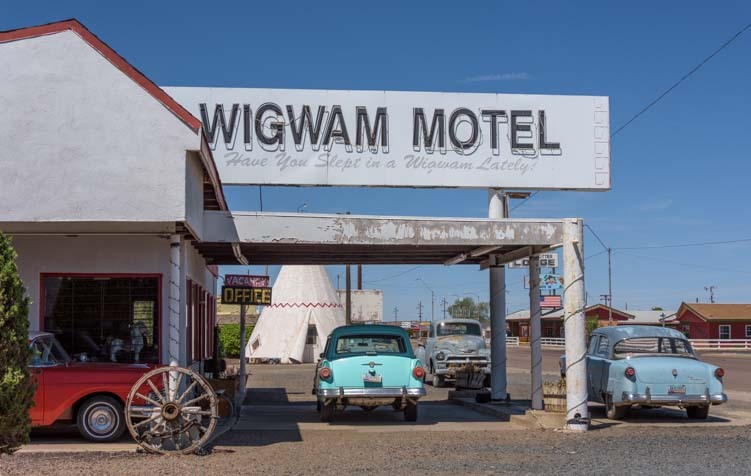 The wigwams still rent out each night, and we saw people loading and unloading their bags for a night’s stay. 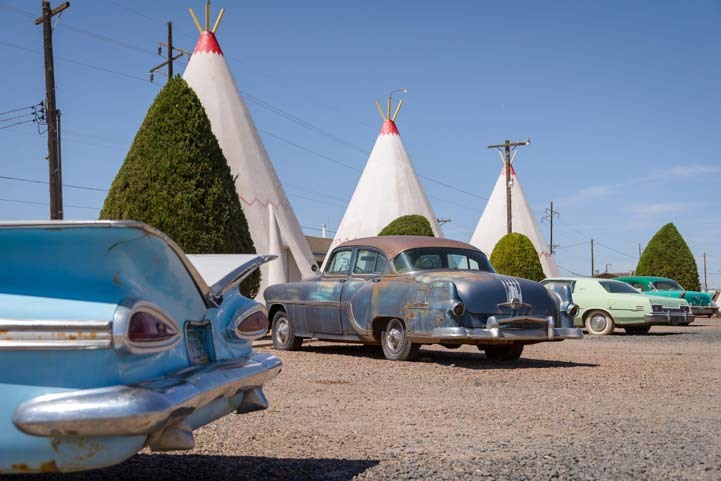 Modern travelers come in modern cars, but antique cars were parked in front of each wigwam! 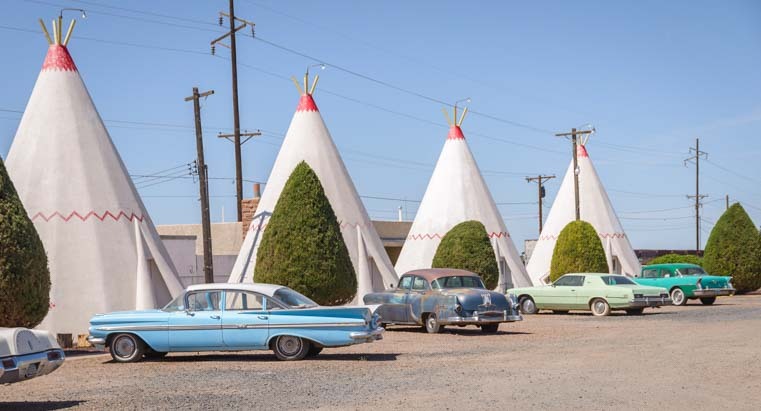 The motel’s owners have parked antique cars in front of each wigwam, lending an authentic air to this classic Route 66 stopover. 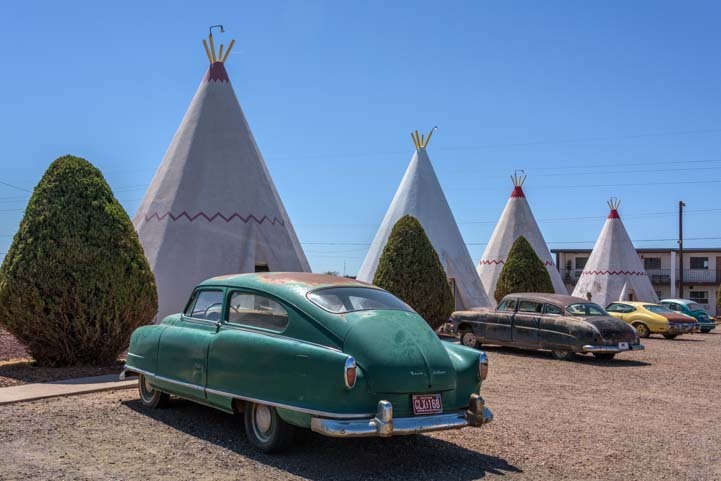 Of course, there’s plenty of room for Wigwam Motel guests to park their modern cars by the front office, but part of the mystique of sleeping in one of these wigwams is the fun historical context of being immersed in early American car travel on old Route 66. 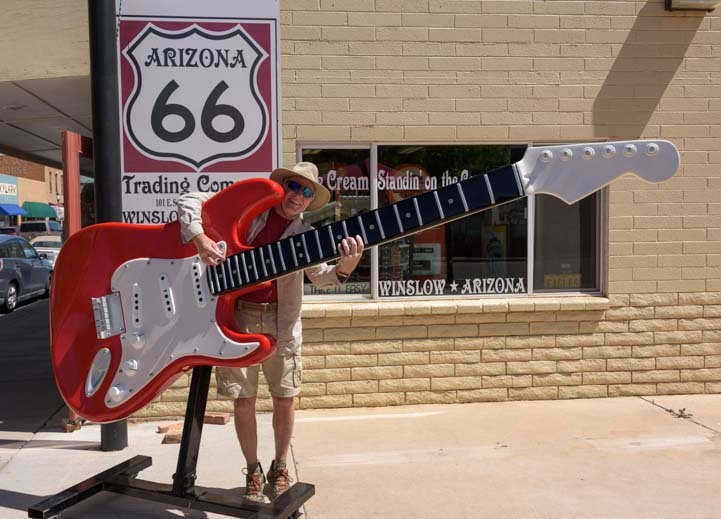 If you are traveling east-west in northern Arizona, in the neighborhood of I-40, take a detour off the freeway to one of these stops near Kingman, Winslow and Holbrook and get your kicks on Route 66! 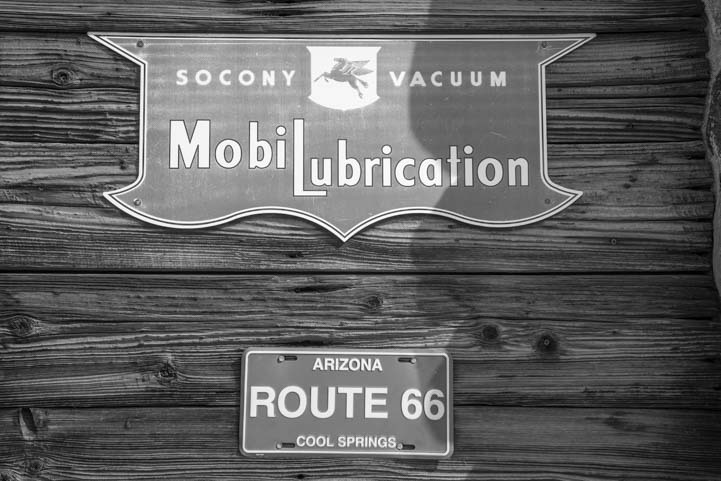 A service shop from yesteryear… Luckily we didn’t need a new muffler or garage mechanic! The level of detail is astonishing. In the video they show guests there they talk about the incredible detail that Mary Colter designed into each room — decorations on the doors, construction of the ceilings and on and on — and they have lots of before and after photos of what the place looked like when they bought it and what it took to bring it back to life. 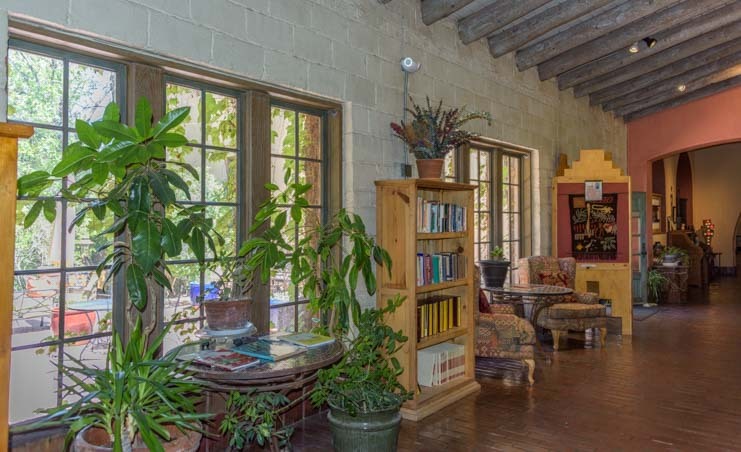 I have since learned that the owner has done this kind of renovation to several similar antique properties in New Mexico as well. Amazing!! Great pictures, thanks for sharing! I’ve heard a lot of “route 66” is now hwy 40, which runs all the way to the east coast. If correct, that’s cool – coast-to-coast. I-40 does run from coast to coast, as can be seen on this map here going between Los Angeles and Wilmington, North Carolina. Route 66 went between Los Angeles and Chicago, so it was a little different route and didn’t go from coast to coast. 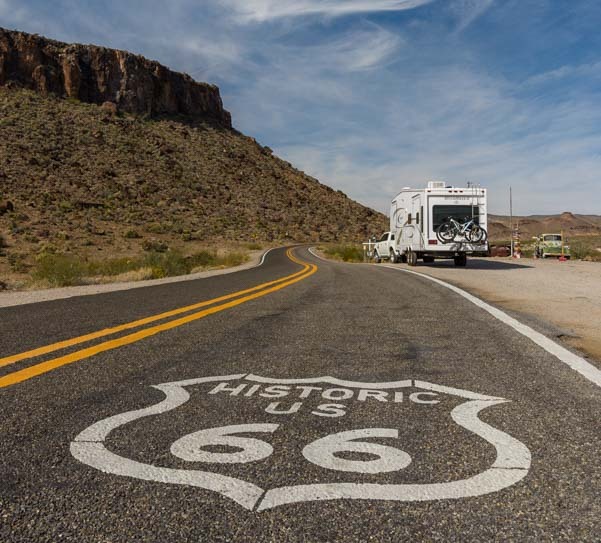 Much of Route 66 in the western states has been replaced by I-40. In places, the old Route 66 runs alongside I-40 and in other places it was replaced with I-40. It was great fun meeting the two of you in person today! We’re currently in Denny’s = much better free WiFi than the McDonald’s here in Shiprock, NM. It’s crazy that we spent three nights that close to you and finally recognized your rig on the last day — may our paths cross again! 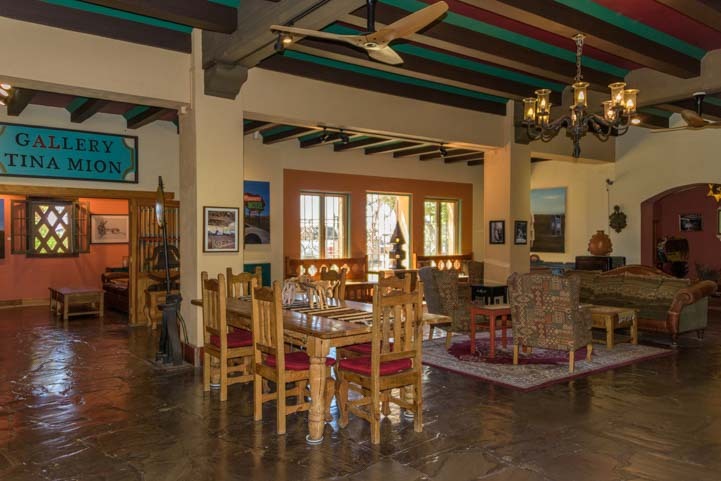 If you make it to the Painted Desert Inn, be sure to ask the ranger if you can see one of the rooms they used to rent out = zoot cute and each room has its own Adobe fireplace. It was wonderful to meet you guys today. I’m so glad we had a chance to chat, even with sprinkles falling on us. 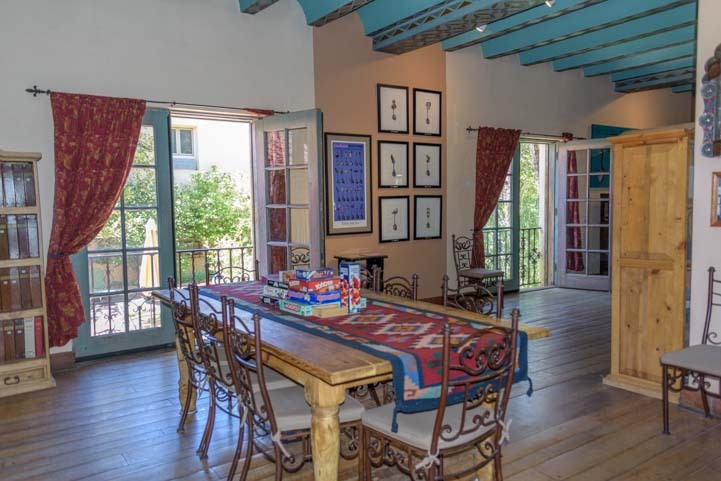 We’ll definitely check out the Painted Desert Inn and ask to see those rooms. 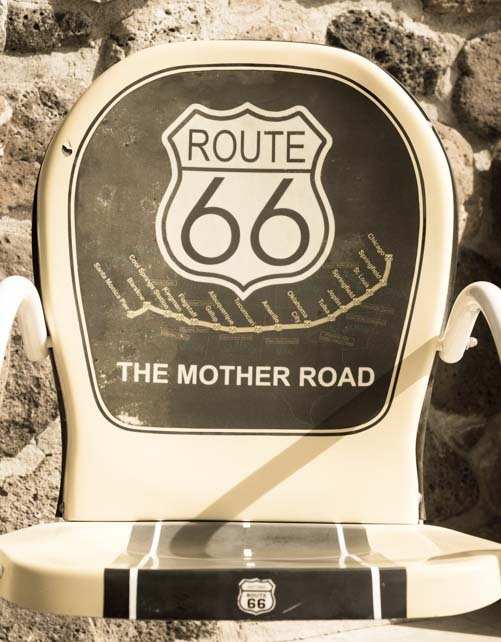 It sounds like we’ll find more interesting history from old Route 66 there! Have fun in Shiprock and enjoy your travels. Wow, some great historical photos. 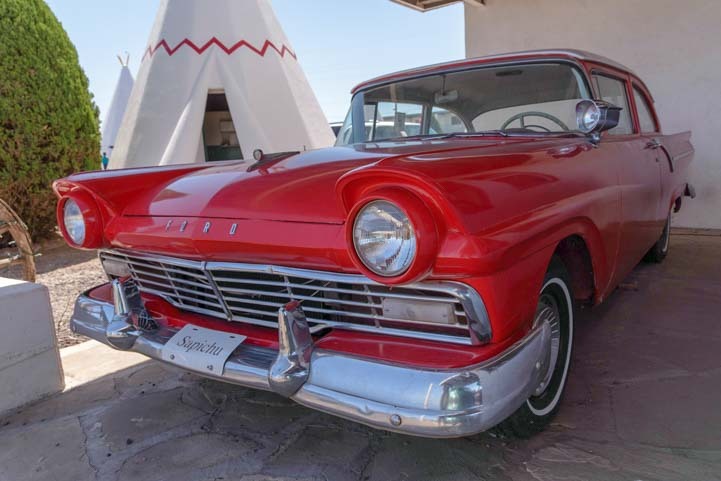 For those of us born in the 50’s that was a real trip down memory lane, even if we were never ableto get to Arizona! Great photos! These are really great spots to visit and a fun way to experience a bit of yesteryear! A pair of storage ottomans transformed our dining area. Ours are on the left, but there are dozens, including the beauty on the right. 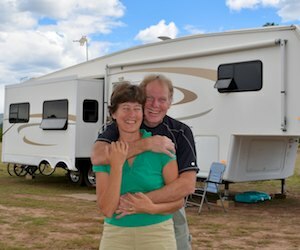 For more info see: Creating STORAGE SPACE in an RV.